This irresistibly cool, ultra micro version of the ParkZone® Spitfire Mk IX is the first Ultra Micro Series warbird to come equipped with the advanced AS3X® (Artificial Stabilization – 3 aXis) System. 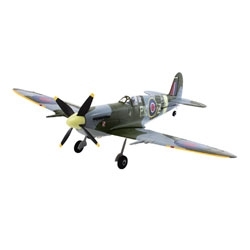 The AS3X System gives this tiny Spitfire a big-plane feel by smoothing out the effects of light wind or turbulence when flying outside. This, along with its precise 4-channel control and incredible level of scale detail, make it one of the most rewarding flying experiences of any size.